Can I Place Character Limits On My Product's Text-Based Options? Yes! As a merchant, you may offer products with text-based options like engraving or written messages; but you may also need to limit the number of characters ordered for these options. For example, let's say you sell a shirt and offer shoppers the ability to have it embroidered with a name or monogram. However, to preserve the overall aesthetic of the finished product, you need to limit the embroidery to 20 characters or less. This article assumes that you already have products with either Text or Text Area options already configured. If you need information on adding options to your products, please click here to review our Options Tutorial article. 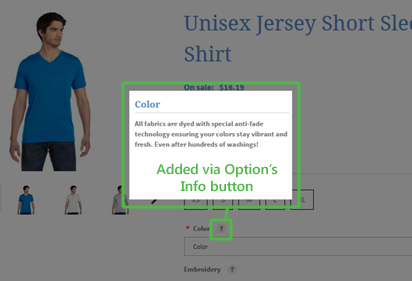 The Info button will normally allow you to add a pop up notification to the product's option to help you explain the option to your shoppers. 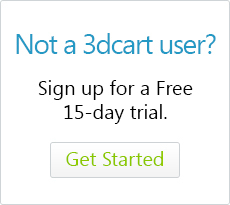 For example, it may link to a sizing chart, or perhaps a simple message telling shoppers more information about the option. When using text-based options however, the Info button will also allow you to specify a character limit for the option. You'll find the character limit control at the very bottom of the Info page. Remember, the character limit shown in the above image will only appear for options using the Text or Text Area option types. All other option types like Drop Down, Radio Button, Drop Image, etc will not have this level of control as it is not needed for their basic functionality.